The remarks came after the pope’s week-long tour of Brazil to celebrate Catholic youth. A Pew Research Center report this spring found that most of the publics surveyed in Latin America say that homosexuality should be accepted by society. 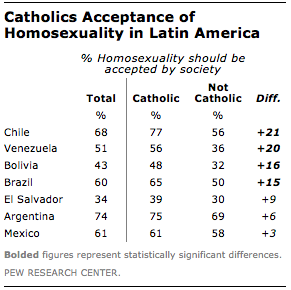 In fact, in four of the seven Latin American countries surveyed (Chile, Venezuela, Brazil and Bolivia) Catholics are more likely than non-Catholics to accept homosexuality. For example, while 77% of Catholic Chileans say homosexuality should be accepted by society, only 56% of those who are not Catholic agree. There are also significant gaps in Venezuela and Bolivia. Meanwhile, 65% of Brazilian Catholics are willing to accept homosexuality in their society, while only half of the non-Catholic population in Brazil feels the same. The survey also found that 64% of Catholics in the United States said that homosexuality should be accepted by society, similar to the 59% of the non-Catholic population who agree. A separate May poll found just over half (54%) of American Catholics say there is at least some conflict between their personal religious beliefs and homosexuality, with 42% saying there is “a lot” of conflict. Finally, a recent Pew Research survey of the LGBT community found that nearly eight-in-ten LGBT adults (79%) perceive the Catholic Church as unfriendly toward them. Among LGBT Catholics in particular, two-thirds (66%) say the church is unfriendly toward them, while 26% say it is neutral and just 6% see it as friendly. Note: The headline of this post was originally titled “Pope’s comments on gays have support within his flock.” It has been modified to more accurately describe the data presented within. Thank you to reader Kevin Loker for his thoughtful comments.